When you receive a message from another user, you will see a notification in the black navigation bar at the top of your screen (figure 1). When you first register on Jazyk, you receive a welcome message, but you can also receive messages from other users. Click on the envelope to go to your messages inbox (figure 2). 1. Open a message: Click on a message to open it (figure 3). 2. Delete a message: You can delete a message by clicking on the trashcan icon. This icon is only visible after you've opened the message. 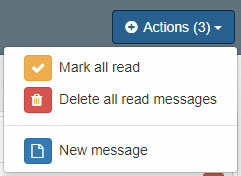 'Mark all read' will mark all messages as opened, which also means you can delete them. 'Delete all read messages' will move all the read messages to your trash folder. 'New message' allows you to send a message to one of your buddies (see your profile): people you follow and who follow you back. Click on the 'Sent' tab to see all the messages you've sent to other users. Just like in your inbox, you can open the messages from here or delete them. Click on the 'Trash' tab to see all the messages you have deleted. Click on the trash can icon to remove the message permanently or use the 'Action' button and click on 'empty trash' to remove all messages in the trash folder permanently.